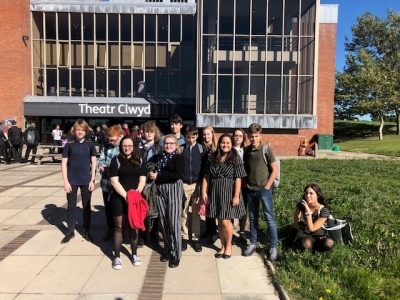 On Thursday 27th September, Natalie took our 12 wonderful GCSE Drama students to Theatr Clwyd to see a production of Lord of the Flies. It was an exciting and innovative interpretation with an all female cast who were exceptional. They stayed for a post-show talk and got to ask some of the actors some questions face to face which will definitely help the students complete some notes about what they saw preparing them for their live theatre evaluation section of the GCSE exam. Natalie would like to thank the students for their perfect behaviour and also thank Debbie for driving us there safely.